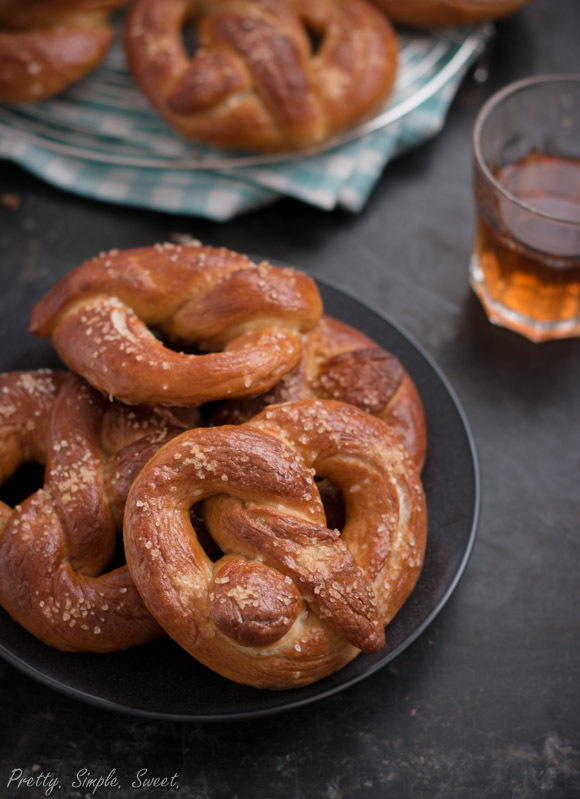 Homemade Soft Pretzels | Pretty. Simple. Sweet. 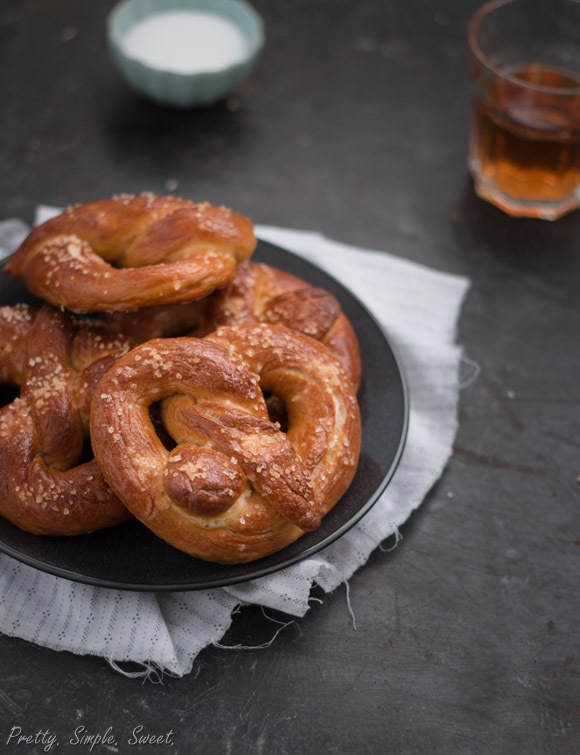 Learn how to make salty, soft, bakery-style pretzels from scratch. Yesterday, I watched the movie Chef and was pretty enthusiastic about it and how well I could connect. In the film, the main character owns a food truck, which for quite some time, I myself wanted to do – only I aimed to sell cupcakes, not sandwiches 😉 The movie reminded me of how much I love food, and how lucky I am to be working with something that I deeply and truly love. Everything about food just makes me happy (well, except the threat of weight gain). I got so hungry while watching that I could barely wait to bake something today! Thank goodness I at least had some popcorn and chocolate with me. As you can probably tell, although I have a sweet tooth that’s unparalleled, I enjoy baking savory treats as well. While I will always prefer a smooth chocolate lava cake over nearly anything else, I simply love all food. Working with yeast is easy once you understand the basics and a few tricks on how it’s done. I’ve had my failures, but once I got it, it became much simpler and so much more rewarding. The process of letting the dough rest and rise may take a while, and I’ve learned that staring at the dough doesn’t help much and to instead do other, more important things in the meantime. To me, the process really is worth the effort. 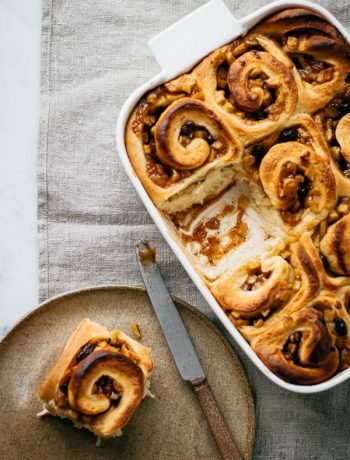 However, if you’re new to working with yeast, you may want to use the guide presented in my cinnamon rolls recipe. 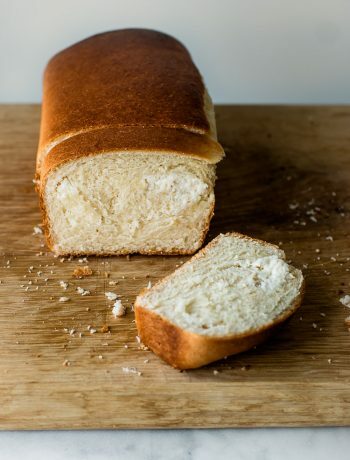 Although the recipe is different, it can help you understand the stages and effort that goes into making yeasted dough. 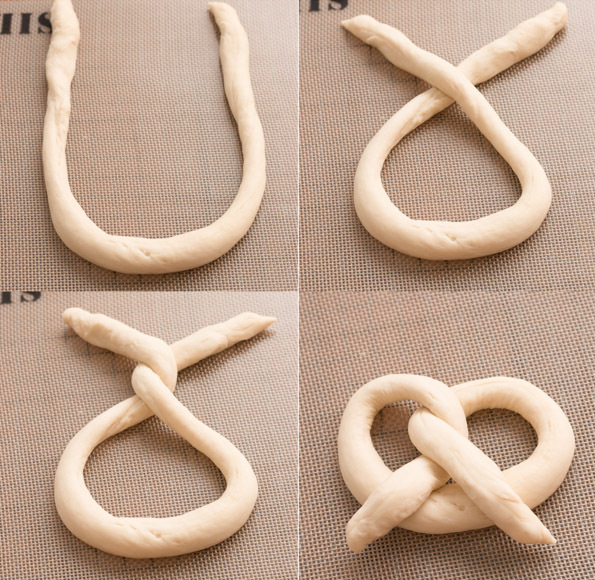 When making pretzels, there’s an extra step not present in other bread recipes. This step involves mixing water and baking soda together in a large pot, bringing it to a boil, and placing each shaped pretzel into the simmering water. While shaping them, they might look a bit small, but once they’ve been dipped in the water, they will puff up and expand. For this reason, don’t crowd too many pretzels at once. The pretzels will look doughy and puckered while in the water. Due to the baking soda, though, this step helps the pretzels to have a fresh baked flavor. Once you taste it, you’ll understand exactly what I mean. Right before baking, you’ll need to brush the pretzel tops with egg (mixed with a tablespoon of water) to help them brown. If you’re a foodie like me, go watch Chef – it will make you hungry and give you a push to work in the kitchen and make these salty treats. They are simply perfect! Place warm water in a mixer bowl and sprinkle some yeast over it. Let sit for 10 minutes until foamy. This step is for “proofing” the yeast; if it doesn’t dissolve and become slightly foamy, then the yeast is dead. In this case, repeat with new yeast. 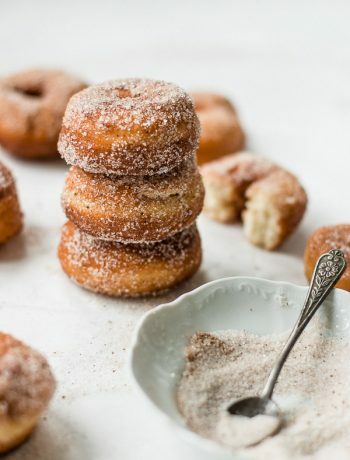 Add sugar, salt, melted butter, and 2 ¾ cups of flour to the water-yeast mixture and stir until combined. Fit your mixer with the dough hook attachment and mix on a low speed until the dough comes together and pulls away from the sides of the bowl. If you don’t have a mixer, mix by hand or use a wooden spoon. If the dough is still wet at this point, add more flour – 2 tablespoons at a time, up to 3 cups total. Keep kneading on low speed in the mixer for 5 minutes, or by hand on a floured surface for 7-8 minutes. The dough should be soft, smooth, and just slightly sticky. Shape the dough into a ball. Lift it and spray the bowl with a non-stick cooking spray to prevent the dough from drying out. Turn the dough over to coat both sides. Cover the bowl with plastic wrap and let rest in a warm place* for about 1 hour, or until the dough doubles in size. When it’s finished rising, gently punch to remove air. Divide into 8 equal pieces. Roll each piece into a rope (1cm width, 50cm long) against the counter using the palms of your hands. Lift the ends of the rope toward the top of your work surface to form a U shape, then cross them. Cross one more time to make a twist, then bring them back down over the bottom loop (towards yourself) to form a traditional pretzel shape (see the post above for a picture demonstration). Place on a baking sheet lined with parchment paper and continue shaping the rest. When all pretzels are shaped, cover them loosely and set them aside to rise until puffy, about 20 minutes. Next, prepare the water bath. Place 6 cups of water and baking soda in a large, wide pot. Bring to a boil. Reduce the heat to medium to maintain a simmer. Using a large slotted spatula, and working with 1-3 pretzels at a time (depending on how large your pot is and how many pretzels will fit), place pretzels into the water and let simmer for 30 seconds. Flip pretzels over and let simmer for another 30 seconds. Lift the pretzels and allow any excess water to drip off. Return pretzels to baking sheet. Brush pretzel tops with egg and sprinkle with coarse salt. Bake until deep brown and glossy – 12 to 15 minutes. Transfer to a cooling rack. Serve warm or at room temperature. Pretzels are best eaten the same day they are made, but can be frozen for up to 2 months in an airtight container. *Here’s a trick to help your dough rise: Put an oven rack in the middle of your oven. Fill a pan or bowl with hot water and place it on the bottom. Let the dough rest on the rack in the middle and close the oven door. However, this is optional: you can let the dough rest on the counter as well. Ohhh… I love pretzels!!! Those look wonderful! This looks delicious.I’m going to try this reciepe tonight. I hope it turns out well. Thank you Hazel! I hope you’ll like it! I have a similar recipe. I omit the egg wash. And use my bread machine to make the dough. Which simplifies the process for me. I agree the baking soda bath is key. As with bagels. It just gives that wonderful, chewy feel. One of my favorite movies! My dad & I still talk about it & watch it every so often. 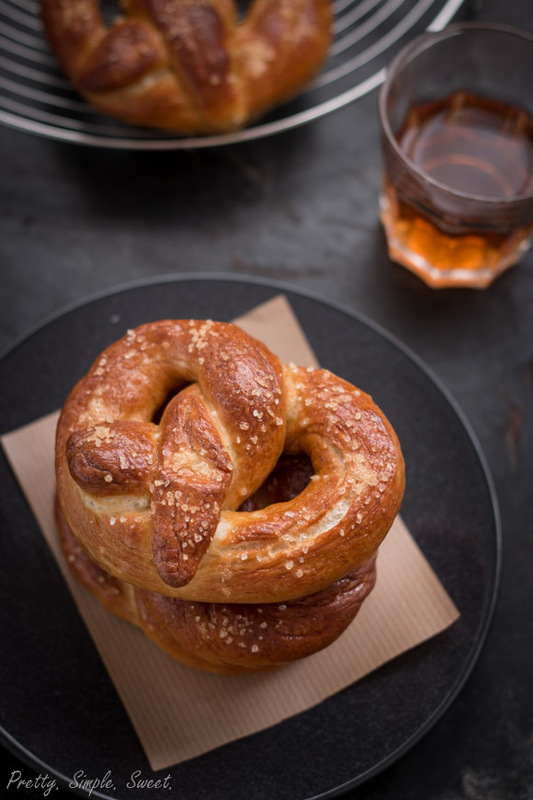 Anyway, I’ve been looking for a good pretzel recipe and can’t wait to make this!